*This unit must be used in conjunction with an active non-HA Firebox M440 appliance. Real-time Visibility - A suite of big-data style visibility and reporting tools are included at no additional cost. Use the Policy Map dashboard to quickly find active and misconfigured policies and drill down as needed. Outstanding Performance - Up to 6.7 Gbps firewall throughput and 3.2 Gbps VPN throughput. Turn on optional security services and still see an amazing 1.6 Gbps throughput. WatchGuard leads the industry in performance when those critical services are enabled. Quick and Secure Setup - Take advantage of innovative features like drag-and-drop VPN creation and RapidDeploy technology to make fast work of extending your network. Advanced Networking - Intuitive management console enables quick copying of corporate policy across multiple appliances. Remote Connectivity Options - Includes SSL and IPSec VPN for flexibility in remote access with support for Apple iOS devices such as the iPhone, iPad, and iPod touch. Powerful subscription-based security services boost protection in critical attack areas for multiple layers of defense. By partnering with leading technology providers, WatchGuard is able to integrate best-of-breed security components into one NGFW or UTM platform for stronger security at big cost savings. Interactive, real-time monitoring and reporting - at no additional charge - give an unprecedented view into network security activity for immediate preventive or corrective actions. WatchGuard Dimension™, a public and private cloud-ready visiblity solution, instantly turns raw data into security intelligence. Firewall throughput of up to 6.7 Gbps and UTM throughput of 1.6 Gbps. Optional Centralized (Multibox) Management. Optional licenses enable Drag and Drop VPN and one-touch appliance updates. 4-device WatchGuard System Manager license included with purchase. Appliances activated online receive an automatic 5-device bonus pack. 4-device WatchGuard System Manager license included with purchase. 4-device WatchGuard System Manager license included with purchase. 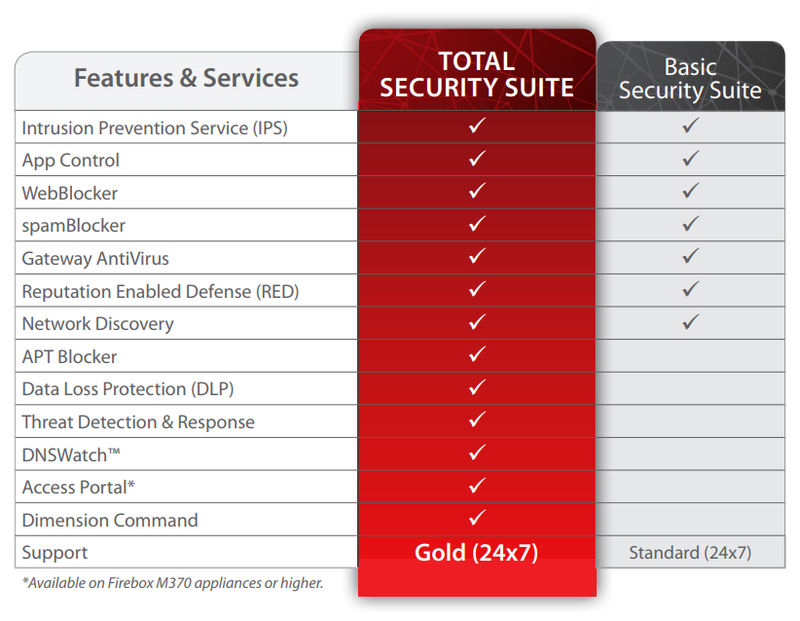 Download the WatchGuard Firebox M440 Datasheet (PDF).